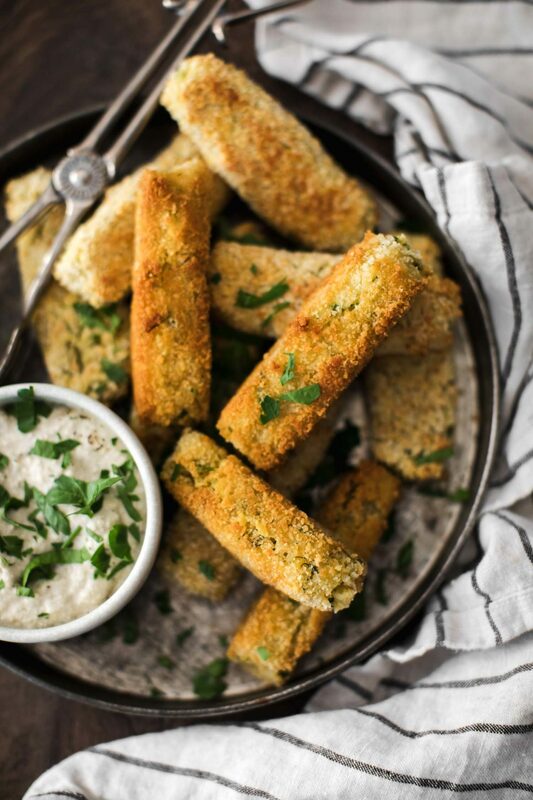 Potato Chickpea Croquettes with Garlicky Sunflower Dip | Naturally. I know I’ve mentioned before that I have a penchant for fried foods. It’s a once-in-awhile treat but there’s just something kind of magical about a crisp outside and a perfect inside. Given this love, it’s a bit surprising I’ve not shared croquettes before given the literal definition (bread + fried, made with potatoes). It’s easily a winner and although it takes a bit of time, I’d gladly make these for dinner. This version is adapted from a classic potato version. In place of some of the potatoes, I’ve added chickpeas. 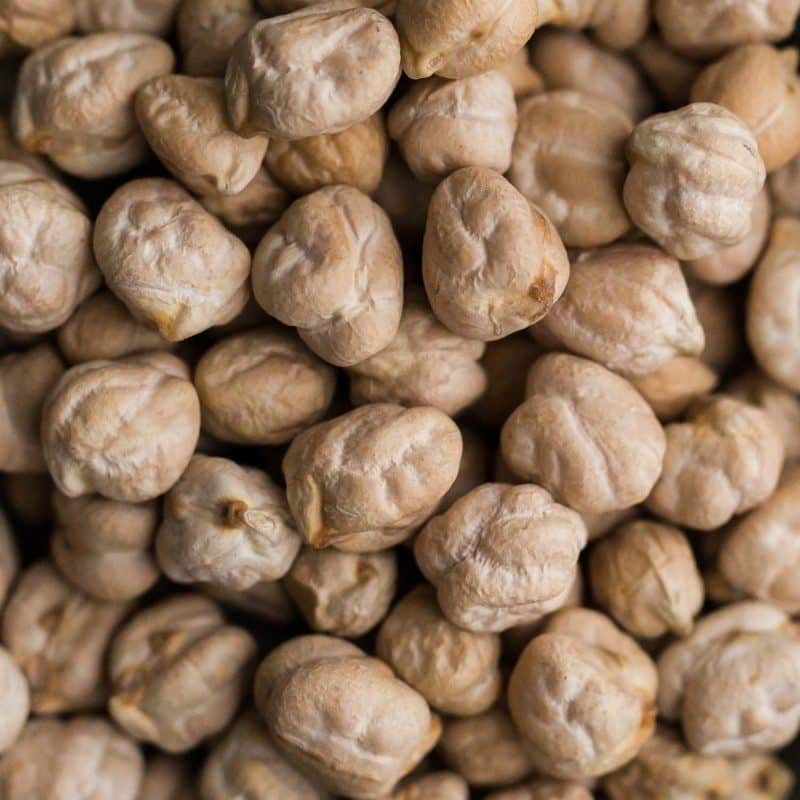 Once the these chickpea croquettes are fried (or baked) up, the chickpeas are barely noticeable. Add to these, a delightful dip and you have yourself a perfect snack or if you’re me, dinner. I will also say, the color and the crispness is much better when fried. However, I know this isn’t everyone’s favorite method so I’ve also included instructions on how to bake. You could also prepare these ahead of time, freeze, then bake/fry whenever you were ready! I’ve not done much adapting in this recipe but there are a few ways to have some fun. Also, I’m thinking you could probably make these vegan by dropping the egg(s) and using a bit of flax in the mix and a bit of non-dairy milk and starch in the breading. Herbs: Swap out the herbs for whatever you have on hand (or leave them out all together). 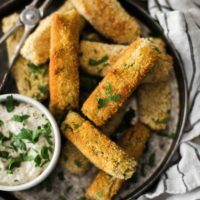 Cheese: I think these chickpea croquettes would be amazing with about 1/2 cup of sharp cheddar cheese mixed into the potato/chickpea puree. Gluten-free: Use your favorite gluten-free breadcrumbs. 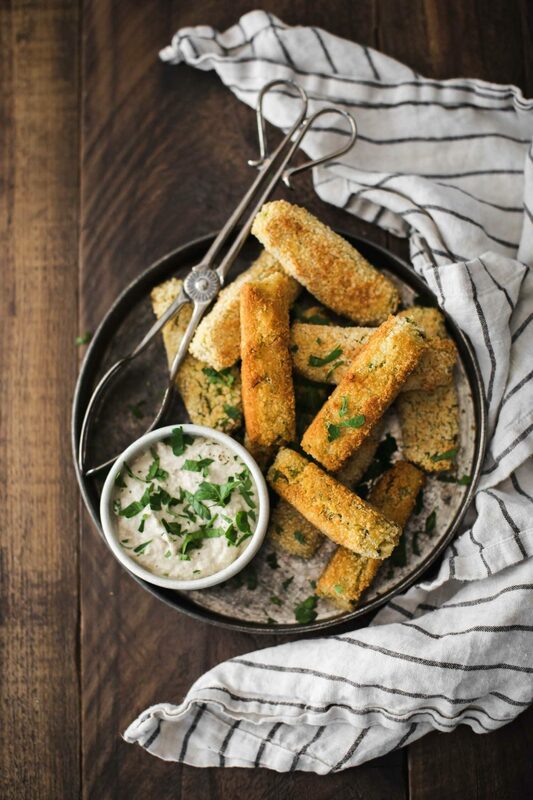 Crisp outsides and creamy centers, these chickpea croquettes are the perfect snack or dinner. Place the all the ingredients, except the herbs, in a food processor or blender. Pulse until the mixture is fairly smooth. Add the herbs in a pulse a few more times. Transfer the mixture to the refrigerator and let rest for 20 minutes. To get the croquettes ready to cook, remove the mixture from the refrigerator. With your hands slightly wet, take about ¼ cup worth of mixture and pat/roll it into a log that is roughly ½” thick and 4” to 5” in length. Place it in the whisked egg then transfer it to the breadcrumbs. Pat the croquette into the breadcrumbs, flatting the sides as you do. Repeat with the remaining mixture. To Fry (my preferred method): Heat ¼” of oil in a pan with tall sides. Place the croquettes in the hot oil and fry for 2 to 3 minutes, until crisp and gold. Repeat with remaining three sides. To Bake: Heat oven to 425˚F. Make croquettes as written and place on a sheet tray covered with parchment. Brush with a bit of oil and bake for 15 minutes. Flip and bake for another 10 to 15 minutes until crisp and golden. To make the dip, pan-fry the garlic in the olive oil until it’s golden then add it to a blender with the remaining ingredients. Purée until smooth, add more water as needed. Taste and add salt. Serve the croquettes the sunflower dip. Link: recipe adapted from these potato croquettes. These are incredible. Also a huge fan of fried foods, especially when there is fresh ingredients inside like chickpeas and herbs. Love this! I give a general idea of how to do it in the variations section (essentially use egg replacer in the croquettes and non-dairy milk/starch as a breading binder. Oh goodness these are lovely and sound just wonderful!